Almond Roca Chocolates, Dark Chocolate Pretzels. Chocolate Balsamic Strawberries, Pomegranate Truffles. Chocolate Cherries, Cinnamon Almonds and more. Each gourmet item individually wrapped for freshness and carefully assembled by hand to safeguard the shipping process. A free card with your personal message or greeting is included with your gift. 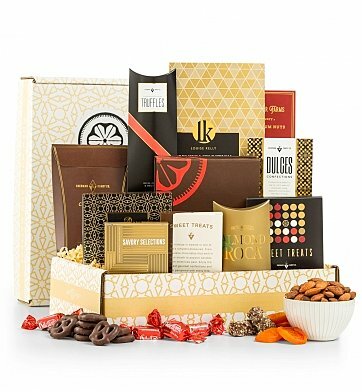 Your gift will leave a lasting impression as your recipient opens, unpacks, and enjoys the confections inside our exclusively designed mailer. Measures 12" x 8" x 3". Gold Star Gourmet is a hand delivered gift. These gifts are delivered by one of our local design centers located throughout the United States and Canada. Same day delivery is available for most gifts when ordered before the cutoff time. The cutoff time for Gold Star Gourmet is 2 PM in the recipient's time zone. Chocolate strawberries, cherries, pomegranate truffles. GiftTree's exclusive signature mailer gift box. The gift was perfect for a large family with kids. They loved it and it arrived earlier than the expected shipping date. So beautifully organized and packed into a nice gift box. Package arrived on promised date. Recipients were impressed by the elegant packaging and presentation. They really enjoyed the delicious snack items. Will definitely send again on other occasions. I ordered 3 boxes for gifts - all arrived as scheduled and all recipients were pleased. One remarked that it was amazing how much could be fit into that box. My sister loved the gift, again! WOW was the comment I got. The only issue was with FED EX delivering the package at 11:15 P.M. Called with my concerns and customer service went above and beyond for something they cannot control. I love GiftTree! The receiver was very pleased. Thank you! My wife loved this very much! Thank You for great service. I ordered this gift for my dad's birthday and it arrived on time and was packaged beautifully. The letter I attached was very neat and he loved the gift! I manage a high profile home office visit program for a financial institution. I usually have the baskets delivered to the hotel when I have guests coming to the home office. Very impressive and reasonable. This gift was sent to my friends and they reported that not only was it packaged beautifully, everything was extremely tasty! My mother said everything in it was great and she was enjoying sampling all of the goodies! As usual, the gift was delivered on time and I was kept up to date from the ordering process up to and through delivery. Love GiftTree.com! recipient loved the gift. I love everything about this site and plan to return when I need to send a quality gift. I sent this to my mom as a thank you gift. She and everyone there loved it. I didn't get to taste it for myself (I live too far away) but just going by their responses I would order it again.